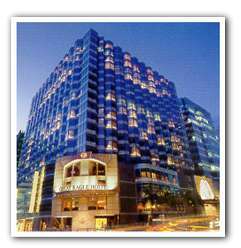 8 Peking Road, Tsimshatsui, Kowloon, Hong Kong. Other Info: Special business rooms with workstation area, fax ,laser printer and computer with unlimited Internet access. In the heart of Kowloon, with easy access to the Star Ferry, Mass Transit Railway and Hong Kong International Airport at Chek Lap Kok. Great Eagle Hotel has it all. For business, shopping, dining, sightseeing and entertainment, everything is either at your doorstep or within easy reach. What better way to explore one of the most colourful and vibrant cities in the world.